For so long I didn’t bother knowing the difference between the temporary resident visa and work permit. Because I came to Canada through the Live-in Caregiver Program (LCP), I received my visa in the Philippines and work permit at the port of entry (Vancouver International Airport). I was lucky to meet the 24-month requirement in Live-in Caregiver Program before my work permit expired. I renewed my Philippine passport before I applied for an open work permit along with permanent residence. All temporary foreign workers have to renew a Canadian work permit at some point until such time a permanent resident status is established. Apply at least 30 days prior to expiration of work permit. Check the end of validity of your passport. My rule is to renew my passport a year prior to the expiration date through a consular outreach program or to any Philippine embassy or consulate in Canada. Since December 13, 2016, the cumulative duration (maximum of four years) NO longer applies. You can work temporarily in Canada for a MAXIMUM of four years. The applicant should live or work in another country before applying to work in Canada again. Let’s assume you’ve recently renewed your passport. So the next thing to do is gather the requirements. The two forms are the usual documents to fill out; head on to CIC’s website for the complete application package. So don’t get confused; focus on your category. The next thing to do after completing the forms and gathering all the other personal documents is to find out how to submit the application. While I was a temporary foreign worker I was able to try these two methods. I’ll share the good and the bad and which one is my favourite. The following tips will give you an overview on what to expect in applying online. It will help you prepare for the day that you have enough time to sit down on your computer and printer and almost-perfect WiFi. You cannot be IDLE for a long time or else you’ll have to start a new session. You have to answer the questionnaires (the same way to get a work permit) to find out if you are eligible to apply online. Don’t delay creating a MyCIC account because you can save time in the future if you have to renew a work permit in Canada several times or apply for other types of permit/visa. Not having a credit card is the one thing that will stand in your way besides a low to no WiFi signal. Credit card is the ONLY way to pay the fee for online application. If you don’t have a credit card, you may ask a friend to lend his card and immediately pay back. Note: For caregivers you can renew your open work permit online by following the same procedure. But to apply for the initial application of open work permit you have to submit it through paper (refer to the next process). Ideally you should submit the application for open work permit and permanent residence AT THE SAME TIME. For those who doesn’t have a credit card or didn’t like to tinker with gadgets and technology then submitting the application through mail is the best option. Without further ado, I’ll direct you to the application package. Download and fill out the forms. The Document Checklist (IMM 5556) is your guide in collecting all the requirements. As for the Application to Change Conditions, Extend my Stay or Remain in Canada as a Worker (IMM 5710), you have to VALIDATE it. (Bar code is made as an addition to the form.) I prefer to fill out the form first and check several times before validating. But if you spot any errors in the hard copy (printout), you can still edit and print only the altered page. No need to print the bar code again. Submitting the application for the renewal of Canadian wok permit through mail has an advantage in paying the fee. You can either pay online or to your bank or wire service using the Fees Receipt (IMM 5401). You may also grab a free copy of mailing address template. It’s free and easy to use. Download the document and add your information. The renewal or initial work permit fee is $155.00 which is NOT refundable. So to avoid paying unnecessarily, check if you are applying for the right permit and that you are eligible to renew a work permit in Canada. Read the full details on how to pay and to find out the current fee on the Instruction Guide. Whether you pay online or use the fee receipt, don’t forget to include the receipt with your application. And make a photocopy for yourself. And I am confused why paper application is faster than online. Still, I recommend you to submit online. I helped a friend to renew a work permit in Canada through online application. Within a few days he received a message (on MyCIC account) that his application was APPROVED. The new work permit was delivered in his mailing address. How’s that for a peace of mind. It happened in March 2015. He was so happy and I was amazed since I didn’t get any message when I applied online but I got mine within one and a half months in 2013. That’s all my tips for now. It’s time for you to use it wisely. Use all the changes to your advantage but PLEASE don’t ask me how long it will take you to renew a work permit in Canada. I wish you can get it in a few weeks. I really do because I know what it feels like to wait. On weekdays I checked the mailbox every day. And over the weekends I can’t wait for Monday to come. You don’t have to wait with anxiety like I did. If you have time, you can work on the application package more than 30 days prior to the work permit expiration. I’ll leave you with a tip more important than this post. Your next goal is to apply for permanent residence if you are a temporary resident. Take advantage of every opportunity to be sponsored by your current or prospective employer. Use your time spent working in Canada to secure your future. Once you’re done with PR aim for a Canadian citizenship. Am I looking too far ahead? I’ll bring you back here in the present. How’s your preparation so far? Or how was the processing time? Share your story in the comment. 2. The next process after being approved to extend my stay in Canada as caregiver is to renew my temporary resident visa, then apply for both open work permit and permanent residence at the same time. Is it correct? Hi Thu. Let’s get straight to your questions. 1. From what I did before, LMIA is not required if you have the same employer. You can check to confirm if it is still applicable through the checklist. 2. If you have met the required hours of work, then you can apply for OWP and PR. As for the resident visa, you’ll only need it if you are going out of the country because you have to show it at the point of entry/airport. Hello! same question here..our live in caregiver arrived july 21 2017 and her work permit will expire july 20, 2019. So if our understanding is correct, she will never comply the 24 months requirement for PR application UNLESS she will apply for an extension. So, do we need to apply a new LMIA for her? She has to renew her work permit Antonette. But it’s a long way to go. Notice also that the policy for caregivers keeps on changing so both of you should stay up-to-date to the changes and renew the permit 3 or 2 months (can’t remember which one) before the expiration. Hello, I just did my renewal of open work permit and it has been validated. But the problems are first I didn’t have a chance to pay it online because the computer shop that I went through is closing and the computer shut down. And Ive already printed out all the paper. The question is can I still pay it on the other day? Or everything will be wasted because I didn’t pay it right away and will start all over again? Second problem when I checked the paper that I’ve printed out I didnt type my ICU number, what will I do to that? Thaanks and hoping for your reply because I’m worried that all the paper that I did was useless and need to start all over again? Rosalie to pay online, you need to register on CIC and use a credit card. Once you’re done paying you can check the record of payment online. Download the PDF copy of the receipt and print 2 copies (for yourself and the application). As for the ICU number, you can write it on the form using black pen. Tip: download the form and save it on a USB so you can save and edit the form later using any computer with Adobe Acrobat Reader or other reader like Foxit. Hello… thank you for sharing. It is really useful. I am just wondering if you renew your contract with the same employer, do they accept a new contract signed by both parties without applying for a new LMIA? Daisy it depends if the job requires an LMIA or not. In the Live-in Caregiver Program, that was years ago, I didn’t submit any new contract nor my employer was required to apply for LMIA. I submitted the requirements through mail and didn’t have any issues. You can also refer to the checklist and instruction guide for more tips. Hi Ka. I’m not familiar with ITA or Invitation to Apply. 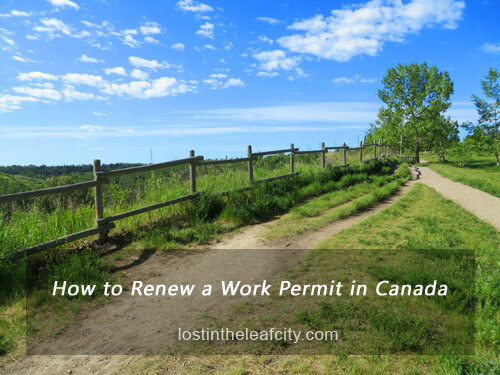 Since your husband’s work permit is about to expire in July, it’s logical to renew it. Just to give you an idea, when I used to work as a caregiver, I also renew my work permit while waiting to become a permanent resident. But as always, the best solution is to call the CIC/IRCC for clarification. I hope you’ll share the outcome for others to learn from. Good luck! This is Great information. As one visit with work permit to Canada, the duration of work permit is limited. So to carry out your work further, imperative is to extend the work permit for more time. This information will really helpful. Thank you. Hi, if I apply for new work permit, do I need to take medical exam? Thanks! You don’t have to take a medical exam Daisy. Great article and thank you for effort. I want to extend my work permit as Refugee claimant. when I answer all questions to evaluate the eligibility, it gives my three options in which category I should apply for immigration. I am already here in Canada. The only thing, I need , is to extend my work permit online. Can you specify what are the choices Alkhatari? Thank you so much for all the help! I will apply my extension online on Sunday. I hope I will do it properly. Thank you so much for answering. Much appreciated. Another thing, when I apply through online, I read that I have to print the bar code and send it to the address provided? Is that correct. Because, I’m still wondering if I should scan my documents or my photocopies are enough. Thanks again in advance. Welcome Maria! I’m not sure I’m following you here. If you are applying online then documents are scanned and uploaded online, but if other requirements need to be mailed then do so. For all the documents that you will submit, make sure you have a photocopy for record keeping. Hi! I am currently in Canada and would have to apply for my work extension. I am so thankful I found your blog as I am having a hard time figuring out on how to apply. “Photocopy of job offer letter from prospective employer”, does my current employer needs to make a new one? Welcome Maria! Take note of the duration of the contract. If it’s still valid and there’s no changes such as duties and responsibilities, then the old contract from the current employer will do.